Revenue in the Athletic Footwear segment amounts to US$17,973m in 2019. The market is expected to grow annually by 4.0% (CAGR 2019-2023). In global comparison, most revenue is generated in United States (US$16,653m in 2019). In relation to total population figures, per person revenues of US$23.76 are generated in 2019. The Athletic Footwear segment includes shoes specifically designed for sports purposes (e.g. soccer, tennis, basketball etc.). The definition is based on the Harmonized System of international trade (specifically the HS codes 640219 and 640319) which include only functional sports shoes. Most so-called "athleisure" footwear or sneakers, i.e. everyday footwear with an athletic appearance, are excluded from this definition since fashion aspects outweigh functional ones. This segment has seen an upsurge during the past years and has gained in importance in comparison to classic town footwear. 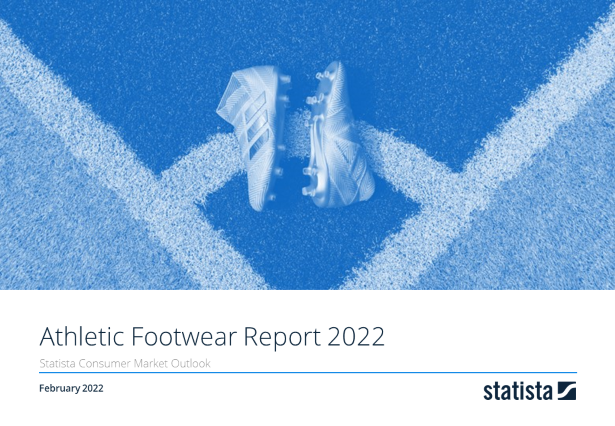 Reading Support Revenue in the Athletic Footwear segment amounts to US$17,973m in 2019. Reading Support The Athletic Footwear segment is expected to show a revenue growth of 5.2% in 2020. Reading Support The average revenue per person in the market for Athletic Footwear amounts to US$23.76 in 2019. Reading Support In the market for Athletic Footwear, volume is expected to amount to 303.69 m prs. by 2023. Reading Support The market for Athletic Footwear is expected to show a volume growth of 2.3% in 2020. Reading Support The average volume per person in the market for Athletic Footwear amounts to 0.4 pairs in 2019. Reading Support The average price per unit in the market for Athletic Footwear amounts to US$63.15 in 2019. Reading Support With a market volume of US$16,653m in 2019, most revenue is generated in United States. Here you can find more studies and statistics about "Athletic Footwear".